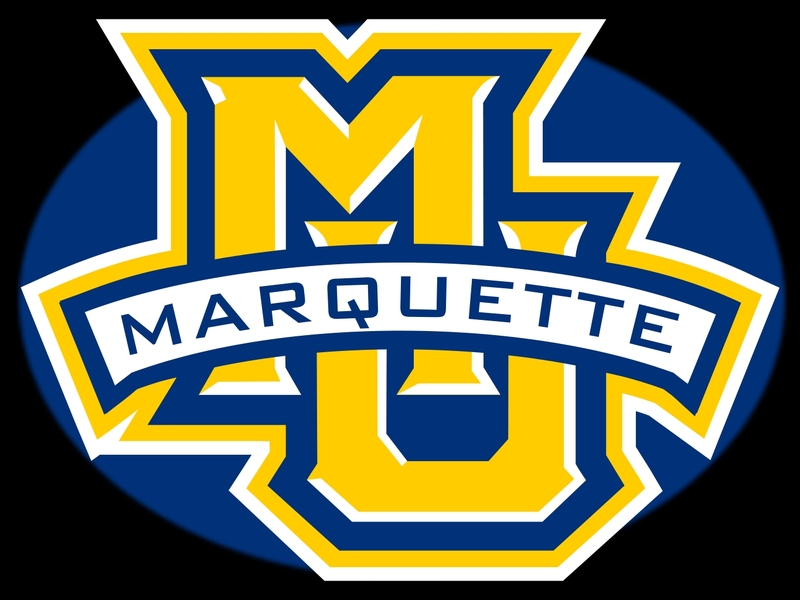 The Marquette women’s basketball team held off a late rally to knock off the DePaul Blue Demons 93-87. Allazia Blockton scored 25 points to lead the Golden Eagles (19-3, 10-0 Big East) to their 10th straight Big East win. The 9th ranked Golden Eagles led by 13 in the third quarter, but DePaul chipped away at the deficit and tied the game with 3:42 left in the fourth on a layup by Kelly Campbell. Blockton gave Marquette a three-point lead with her basket and the foul with 2:01 left. 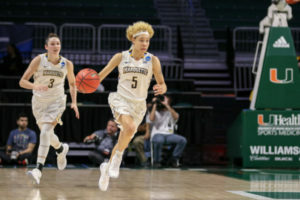 Marquette overcame foul trouble in the fourth quarter and Erika Davenport knocked down two free throws with 1:14 left to give the Golden Eagles an 88-83 advantage. 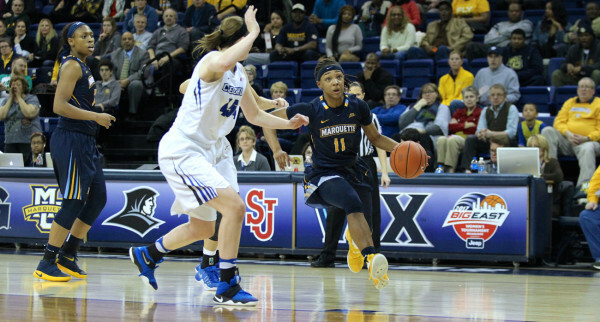 Danielle King had 18 points for Marquette and Amani Wilborn added 17. Senior Marsha Howard scored 30 points, but Wisconsin still lost to Michigan 76-70 on Sunday at the Kohl Center. The Badgers (11-12, 2-9 Big Ten) scored just eight points in the second quarter and trailed 32-22 at halftime. Freshman Imani Lewis also added 15 for the Badgers. 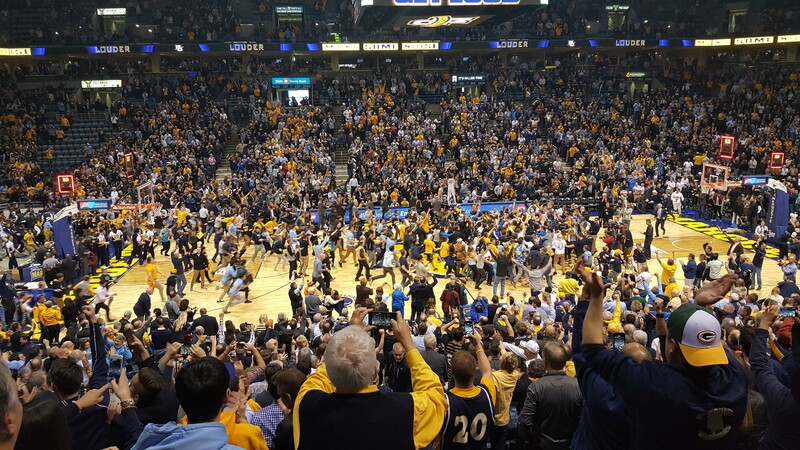 Marquette is adding Kansas State to its hoops schedule this coming season. The Golden Eagles will host the Wildcats on December 1st at the Wisconsin Sports and Entertainment Center. The teams will meet in Manhattan during the 2019-20 season. The Wildcats reached the Elite Eight of the NCAA Tournament this past season and will return a majority of its roster. Most early top 25 lists include the Wildcats. The teams haven’t played since 1988. Marquette is 3-7 all time against Kansas State, with the last matchup coming in 1988. Both Marquette and Green Bay are headed back to their respective conference title games today. Allazia Blockton poured in a career-high 32 points to lead Marquette to a 76-70 win over Creighton in the semifinals of the Big East Tournament on Monday. The Golden Eagles (23-8) will take on DePaul (25-7) in the Big East championship game at 6 p.m. tonight. Amani Wilborn added 16 and Danielle King 12 for the Golden Eagles. The Green Bay Phoenix (28-3) advanced to today’s Horizon League championship game against Wright State. The Phoenix knocked off Youngstown State 66-45 in Monday’s semifinals, reaching the HL championship game for the eighth straight season. Senior Jessica Lindstrom scored 17 points and grabbed nine rebounds to set a program Division 1 record with 1,000 career rebounds. Today’s title game tips off at 11am from Detroit. 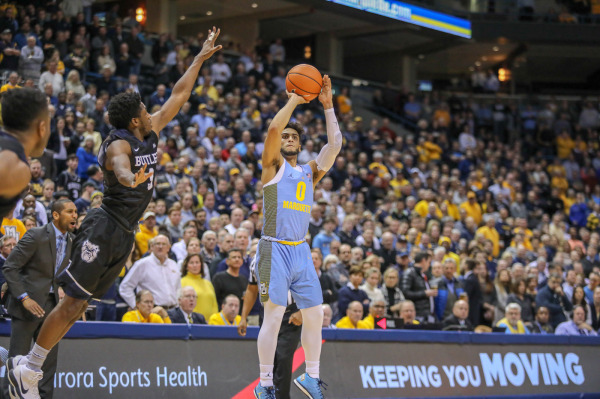 Marquette’s top scorer Markus Howard is doubtful for Wednesday’s rematch against St. John’s at the Bradley Center. Howard suffered a right hip contusion on the Golden Eagles 90-86 win over Creighton on Saturday night in Omaha, Nebraska. Howard is averaging 21.3 points a game, which ranks second in the Big East behind St. John’s guard Samorie Ponds (21.6 ppg). Howard was hurt when he was fouled by Creighton’s Toby Hegner on a drive to the basket late in the first half. He landed hard on his right side and stayed on the floor for several minutes. Howard was helped off the court and taken to a local hospital for evaluation. If Howard can’t play on Wednesday, it’ll be the first time he will have missed a game this season. Marquette (15-11, 6-8 Big East) kept its NCAA Tournament hopes alive with their win at Creighton. Now they have to keep it going against St. John’s (14-11, 3-11) when the two teams hook up for the second time this season. St. John’s won the first meeting 86-78 on February 10. Andrew Rowsey led the Golden Eagles with 34 points in the loss. 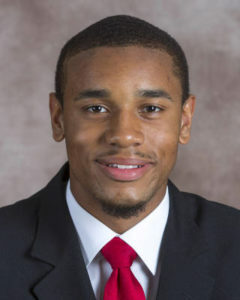 Ed Morrow, who spent the last two seasons at the University of Nebraska, is joining the Marquette men’s basketball program. Golden Eagles head coach Steve Wojciechowski made the announcement Tuesday morning. The 6’7 Morrow will arrive on campus this summer and have two years of eligibility with the Golden Eagles after redshirting in 2017-18. The Lincoln, Nebraska, native appeared in 54 career games, earning 19 starts with the Cornhuskers. As a sophomore last season, Morrow posted game averages of 9.4 points and 7.5 rebounds, starting 18 games. 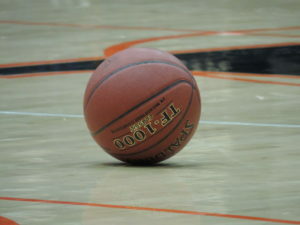 Three of the state’s NCAA Division I men’s basketball programs were impacted Wednesday by news of players transferring. 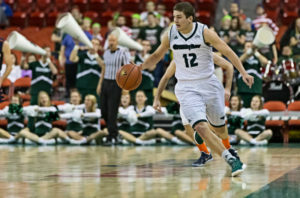 UW-Green Bay freshman Trevor Anderson announced he’ll be leaving the Phoenix, and his scholarship, to walk on with the Wisconsin Badgers. Anderson averaged 9.8 nearly ten points, 2.9 rebounds, and 2.7 assists while shooting nearly 38% from three-point range as the starting point guard at UWGB before a back injury ended his first season. 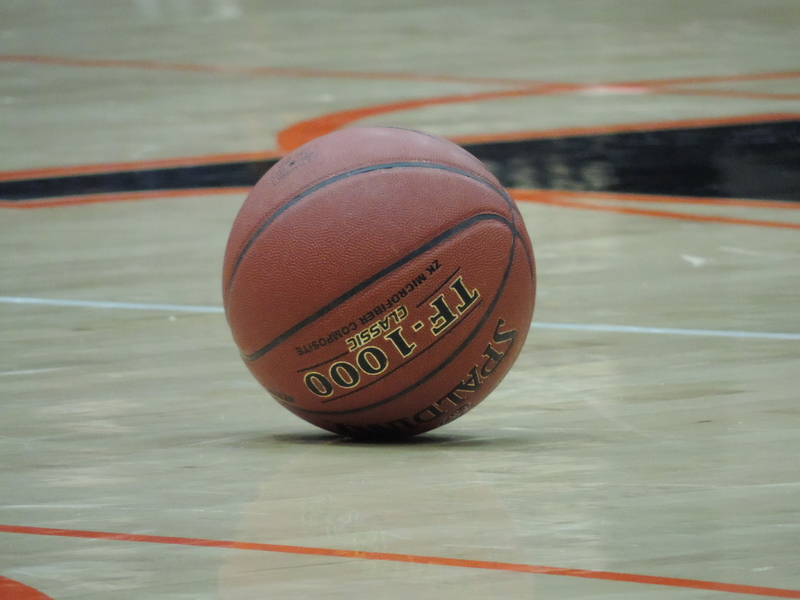 The 6’2″ Anderson was the state’s Mr. Basketball leading Stevens Point Area Senior High to back-to-back state titles. He scored 2,360 points in his high school career. Per NCAA transfer rules, Anderson will sit out the 2017-18 season and have three years of eligibility remaining. 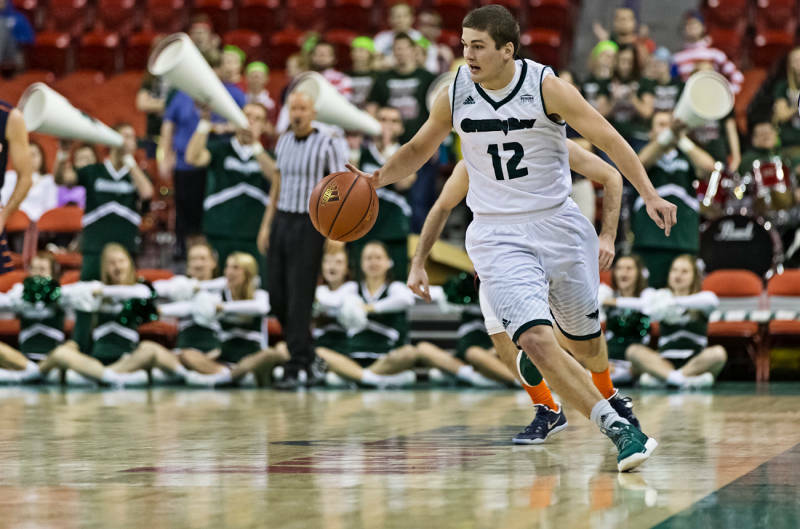 Wisconsin added another 2,000-point prep scorer Wednesday with 6’3″ walk-on guard Walt McGrory from Edina, Minnesota. McGrory turned down scholarship offers from Drake and South Dakota State, among others, to join the Badgers. As first reported by ESPN, the Marquette Golden Eagles will add Nebraska transfer Ed Morrow to their 2018-19 roster. The 6’7″ power forward averaged 9.4 points and 7.5 rebounds last year for the Cornhuskers. The Chicago, Illinois, native will have two year of eligibility remaining after sitting out the upcoming season per NCAA transfer rules. 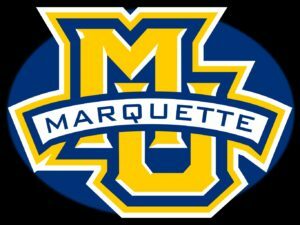 Wisconsin and Marquette each have one scholarship left to use for 2017-18. The Marquette Golden Eagles secured a commitment for their 2017 recruiting class from Detroit East English Village guard Greg Elliott this week. Elliott made the announcement via Twitter on Tuesday morning, picking the Golden Eagles over Michigan State and Providence among others. Elliott is a 6’3 guard who averaged 28 points, nine rebounds, four assists, two steals and 1.5 blocks while shooting 52% from the field during his senior season. Elliott joins two of his close friends, who have already committed to Marquette. Jamal Cain (Cornerstone Academy) and Ikechukwu Eke (University of Detroit Jesuit), all played for the same AAU team. 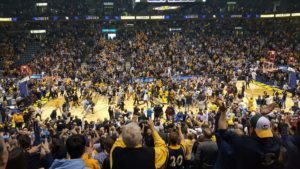 The Marquette Golden Eagles knocked off the 2nd-seeded Creighton BlueJays for the first time this season, winning 72-65 in the Big East Conference Tournament semifinals at the Al McGuire Center. The win sends Marquette (24-7) to its first ever Big East tournament championship game, facing DePaul at 8 p.m. on Tuesday night. Creighton (23-7) entered the game on a nine-game winning streak, ranked 23rd in the country. But the Blue Jays managed to put just one player in double figures in scoring as Sydney Lamberty scored 26 points. Amani Wilborn scored 21 points, Allazia Blockton had 19 points and seven rebounds and Danielle King had 18 points and five rebounds to lead the Golden Eagles. Marquette improved to 5-0 against top-25 ranked teams this season. The Marquette Golden Eagles came from 17 points down in the second half to upset the number-one team in the AP Top 25 Poll, Villanova 74-72 in men’s college basketball action at the BMO Harris Bradley Center on Tuesday night. The Golden Eagles closed the game with a 19-4 run to pull out the win. Katin Reinhardt scored 18 of his 19 points in the second half, including a pair of game winning free throws with 11.2 seconds left.